– I’m going to leave the little living room light on (the one on the wall), just leave that on the whole time, we have been lately because they have had a couple of fights in the middle of the night and they need light so they don’t freak out. – The bowl water please refresh with filtered tap daily. – Food –wise, they get one tablespoon of the pellets and two tablespoons of seed in each bowl. I usually stir it around in the hopes they will accidentally eat pellets. Every day just throw out what’s left from the day prior and start fresh. 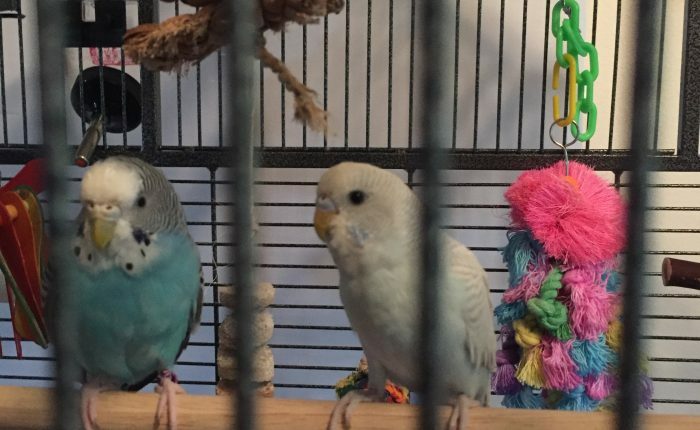 – When you let them out you can move the play gym over so it’s on the hardwood floor still but near the big cage, that way Kelly can jump over by herself. She will try to fly to the perch by the sink window and she can’t make that, so please keep a close eye on her and when she needs help just hold your finger about 5 inches above the floor and say step up, she should jump up and then I usually hold her near whatever I think she was trying to get to and see if that’s what he wanted. – Kelly WILL definitely bite you, especially if you try to move her from someplace she doesn’t want to leave. She bites harder than Toby but doesn’t break the skin. If she does bite hard and you can avoid yelping, we are trying to just say “no” and remind her to be gentle, but don’t retreat. – The tray system under the cage is heavier than it looks. You have to take off the security flap and set it aside – then be sure to use both hands to slide out the tray with the paper liners and set it on the floor. Unfortunately you can’t just pull it most of the way out, in my experience. I’ve been removing the top sheets and discarding every day, but it could go a couple of days without being removed, I’m sure. 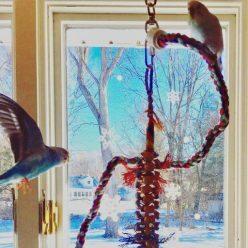 – If the birds are out and you don’t mind doing it, I usually take a damp paper towel and try to wipe down any perches with poop on them every day, especially where Toby sleeps on the brown wood perch her poops pile up every night. But also the other perches and toys, and every few days I wipe down the grate at the bottom because they walk around down there sometimes. If you try doing that while Toby is in the cage she’s definitely going to get territorial and attack your hand and/or the paper towel but it’s doesn’t hurt it’s just annoying. – There’s a stick vacuum in the little blue room for doing under/around the cage. It’s not cordless but it stretches far enough. You don’t have to vacuum every day but every few would be good, I mean obviously you can use your discretion, it gets pretty gross. – Millet as much as you want. Kelly only sort of gets it, she likes millet when she’s in the cage but doesn’t seem to care when he’s out. – Toby still likes to have her head scritched or to scritch herself against your pinkly if you put it through the cage bars but you have to watch out for Kelly, she doesn’t quite understand it and will push Toby out of the way to bite your finger. She’s not aggressive about it, I’m pretty sure he thinks that is what Toby is doing and she’s just mimicking.